In a large mixing bowl, combine the fritters ingredients. If not using any haloumi cheese, add a more generous pinch of salt. Mix well. Heat a large frying pan over medium-high heat and melt 1 tablespoon of coconut oil. 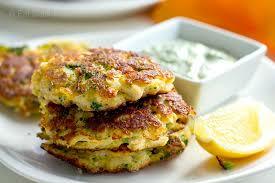 Using your hands, shape the mixture into small patties and add to the hot pan, one by one. Bring the heat down to medium and fry for 4 minutes on each or until golden brown. In the meantime, whisk together the aioli ingredients and serve in a side ramekin. You can experiment with using grated sweet potato or carrots instead of zucchini. 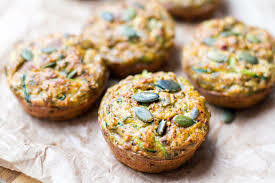 Pumpkin seeds can be replaced with other seeds, and of course, you can use nut meals like ground almonds or hazelnuts if you like. 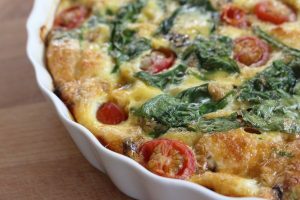 Makes a large family size quiche. Cook onion and bacon in a pan. Once cooked sprinkle over base of flan dish. Place the tomatoes over the bacon and onion. Crack the eggs in a large bowl. Whisk together. Add spinach, salt and pepper and stir through. Spoon egg mixture over the top of the flan dish. Give it a little stir to mix the bacon through and then smooth the top and pop in the oven for 20 – 30 mins or browned on the top and centre cooked. Who doesn’t like baba ganoush? 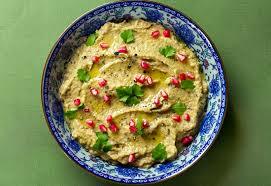 It’s made with eggplant (aubergine), olive oil, lemon and usually with tahini and various seasoning. You can use the oven or a BBQ grill to roast the eggplant. Cooking time: 45 minutes plus cooling time. Cool eggplant for about 1 hour and remove outer skin only. Cut roughly and place in a food processor or blender with garlic, tahini, salt, pepper and lemon juice. Purée until smooth. Serve with a drizzle of olive oil, parsley and some scattered pomegranate to make it extra pretty. Pre-blanch the almonds if you need to. Process all ingredients in a food processor until smooth. Drizzle with olive oil and some paprika and parsley when serving. Store in the fridge with a thing layer of olive oil on top to prevent drying (almonds love moisture). 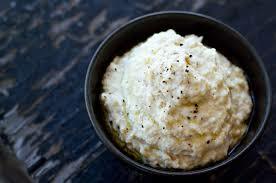 I like to serve this dip with radishes, carrot and celery sticks or red peppers. It’s also yummy on salads and vegetables. 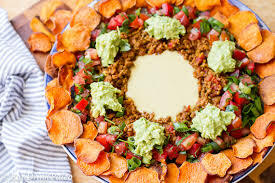 These paleo nachos can be served as a dinner meal or shared between friends. If you can tolerate dairy, feel free to melt some regular cheese over the top. Sweet potato chips – If making sweet potato chips, preheat the oven to 170 C/338 F (conventional, not fan forced). Slice the sweet potato as thin as you can, you can leave the skin on. Use a mandolin slicer or a slicer setting on a food processor if you like. Toss the potato slices in melted coconut oil or olive oil, use your hands to separate the slices and get them coated evenly. Place parchment/baking paper on two flat roasting trays and place potato slices in a single layer, overlapping each other slightly if needed. Bake for 20-25 minutes and then turn the chips over. Bake for another 20 minutes or even longer if you want them very crunchy. Keep an eye on the time if you oven tends to get too hot and reduce by 5 minutes on each side. Spicy beef – In a deep skillet or a frying pan, heat the ghee or coconut oil over medium heat. Add the onion and chilli and sauté for 5 minutes, until golden. Add the beef and bring the heat to high. Cook and stir with a spatula for 5 minutes, separating the pieces along the way. Then add the rest of ingredients, stir and bring to boil. Turn the heat down to low and simmer for 20-25 minutes, with a lid on, stirring regularly. Tomato salsa & guacamole – Combine salsa ingredients in a bowl and set aside. Prepare the guacamole and set aside. Finally, assemble the nachos in the following order. Place the beef in the middle of a large, deep platter. Make a well in the middle and push the beef outwards. Add the tomato salsa around the beef and place the chips on the edges of the platter. Place dollops of guacamole on the beef. Heat a little coconut oil in a frying pan until sizzling hot. Season salmon steak with a little sea salt and pepper, fry over medium-high heat for 1 ½ minutes on each side. Set aside and once cooled down, pull the flakes apart and remove any visible bones. Mix with the red onion. 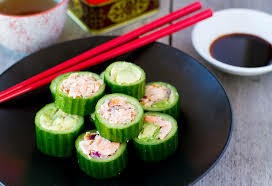 Cut cucumbers into even 1½ – 2 centimetre thick rolls. Using a small knife, carefully cut out the flesh of the cucumber making sure the walls stay in tact. The easiest way to do it is by placing the rolls flat side down and rotating them slightly as you cut through the flesh. You can always cut the flesh out roughly and then carve the walls carefully by holding the ring in your hand. Using your fingers fill each ring with some cooked salmon. Press the mix inside the ring down leaving the top half unfilled. Fill the top half of the ring with the avocado. Push the mix down well, even if some of it starts spilling over the top. You can just wipe the edges before serving. Serve right away or refrigerate for later. You can take these to work for lunch or bring a large platter to a party. 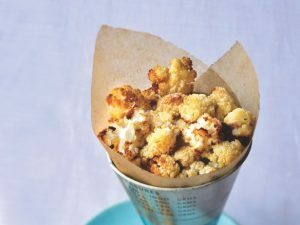 Line a baking sheet with parchment for easy cleanup (you can skip that, if you don’t have any) then spread the cauliflower pieces on the sheet and roast for 1 hour, turning 3 or 4 times, until most of each piece has turned golden brown. (The browner the cauliflower pieces turn, the more caramelization occurs and the sweeter they’ll taste). For those who have nut allergies, you can substitute almond meal for 1/2 cup organic desiccated coconut. I love to serve mine with a dollop of lush natural yoghurt. 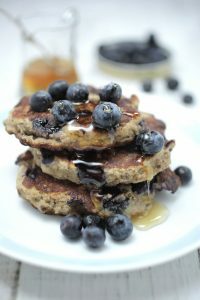 Combine smashed banana and eggs.Add almond meal, linseed, baking powder and cinnamon. 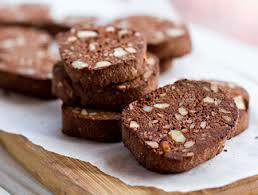 • High protein: Pump up the protein and use 4 tablespoons protein powder in place of the almonds. 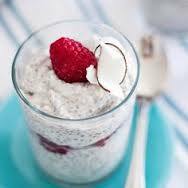 • Nut free option: Use 1/2 cup organic desiccated coconut in place of the almond meal for nut free. 1Process madamia nuts into smaller crumbs in a food processor. It’s ok if you have some larger pieces in there. Add almond meal, coconut flour, baking powder and a pinch of salt. Give it another whiz to mix it all up. 2Add the rest of ingredients and process until well incorporated and you have a thick, sticky, doughy mixture. Scoop it out on to a cutting board or a tray. Shape the mixture into a log, about 3cm radius. Wrap in clingwrap and refrigirate for 15 minutes to set. 3In the meantime, heat oven to 160C or around 350F. 4Unwrap the log and slice it gently into equal size cylinders, about 1 cm thick. Place on a baking paper covered tray and bake in the oven for 11-12 minutes.